The vector pKLMF-EK directs high-level intracellular expression of a recombinant protein fused to the maltose binding protein (MBP) in the yeast Kluyveromyces lactis. It is compatible with the K. lactis Protein Expression Kit (NEB #E1000). MBP fusion proteins expressed from pKLMF-EK can be affinity purified from cell lysates using Amylose Resin (NEB #E8021). MBP can be removed from purified fusion proteins by digestion with Enterokinase (NEB #P8070). 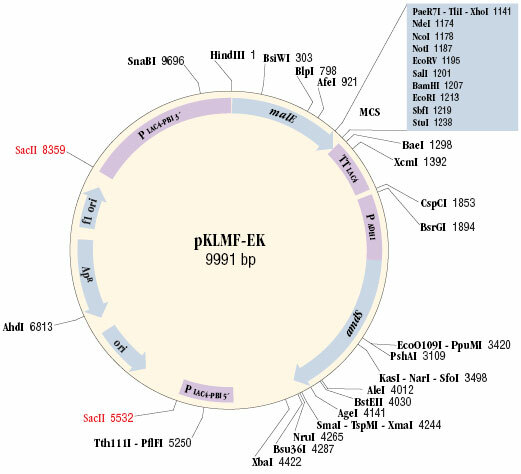 Vector pKLMF-EK contains the strong K. lactis PLAC4-PBI promoter (1), DNA encoding E. coli maltose binding protein (MBP) with a C-terminal enterokinase site, a universal multiple cloning site (MCS), the K. lactis LAC4 transcription terminator (TT), and a fungal acetamidase selectable marker gene (amdS) expressed from the yeast ADH1 promoter (PADH1). An E. coli replication origin (ori) and ampicillin resistance gene (ApR) is present for propagation of pKLMF-EK in E. coli. SacII linearized pKLMF-EK integrates into the LAC4 locus of the K. lactis genome upon transformation of K. lactis competent cells. Visit DNA Sequences and Maps page for more information. DNASU is a central repository for plasmid clones and collections that may also be helpful. PLAC4-PBI promoter does not express in E. coli allowing toxic genes to be cloned prior to their expression in yeast. Universal MCS lies downstream of DNA encoding MBP and PLAC4-PBI promoter. Acetamidase expression for non-antibiotic selection in K. lactis. For proper integration into the LAC4 promoter region of the K. lactis chromosome, pKLMF-series vectors containing a gene of interest must be linearized with SacII prior to their introduction into K. lactis cells. The cloned gene of interest must have no internal SacII sites. After transformation of K. lactis cells by a pKLMF-series vector, its targeted integration into the LAC4 promoter locus can be confirmed by whole-cell PCR using an adaptation of Optional Methods I and II of the K. lactis Protein Expression Kit Instruction Manual (#E1000). In these methods, Integration Primer 2 is a reverse primer that anneals to a specific region of DNA encoding the α−mating factor secretion leader sequence in pKLAC-series vectors, a region that is absent from pKLMF-series vectors. For assessment of the integration patterns of pKLMF-series vectors, a primer with the sequence 5´ d(GTTTACCTTCTTCAGTTTTCAT) 3´ should be used in place of the kit’s Integration Primer 2 in these protocols (2). Whole cell PCR using this primer in conjunction with either Integration Primer 1 or Integration Primer 3 will each yield a 2.3 kb diagnostic amplicon. NEB 5-alpha Competent E. coli (High Efficiency) (NEB #C2987), NEB 5-alpha Electrocompetent E. coli (NEB #C2989) and NEB 5-alpha Competent E. coli (Subcloning Efficiency) (NEB #C2988) are all recommended for propagation and subcloning this vector. Foster, J. et al. (2008). Parasitol. Res. In press. NOTICE TO BUYER/USER: The vector pKLMF-EK or pKLMF-FX is a component of an expression system that was developed from basic research at New England Biolabs, Inc. and DSM Biologics Company B.V. The buyer/user has a non-exclusive sublicense to use this system or any component thereof, including vector pKLMF-EK or pKLMF-FX, for RESEARCH PURPOSES ONLY. A license to use this system for manufacture of clinical grade material or commercial purposes is available from New England Biolabs, Inc., or DSM Biologics Company B.V.